Giacomo Franco. Venice, Italy 1550 – 1620 Venice, Italy. Habiti d’huomeni et donne Venetiane. Venice: Giacomo Franco, 1610. 8 1/8 x 11 ¼ in. leaves of plates (one folded); chiefly illustrations. Bound in 19th-century full red morocco, all edges gilt; binding signed by R.Petit. Inscribed on flyleaf: “W.A.White, 29 January 1890." Athenæum purchase, Bromfield Fund in honor of Michael Wentworth, 2003. 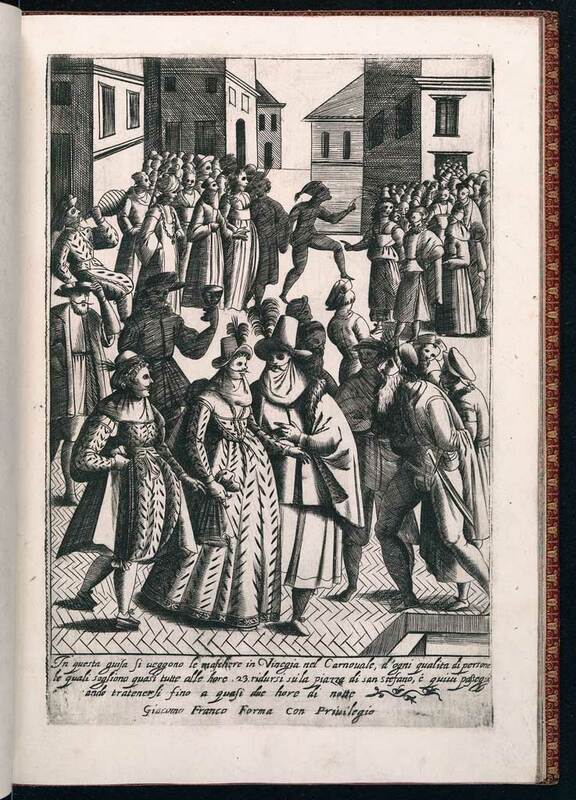 This book of engravings depicts the costumes, festivals, and social life of early seventeenth-century Venetians. There is no text other than a short descriptive sentence at the bottom of each engraving. Major Venetian landmarks are easily recognizable, and the small ovoid map on the title-page is regarded by some scholars as an important example of early Venetian cartography. Very little is known about the Venetian engraver Giacomo Franco. The son of painter Giovanni-Battista Franco (1510-1561), with whom he began his artistic training at the age of eleven,  he worked as a painter, engraver, woodcutter, and dealer in graphics and books. For a while he studied in Bologna with Agostino Carracci (1557-1602) who, with his brother Annibale (1560-1609) and his cousin Lodovico (1555-1619), were prominent figures at the end of the sixteenth century in the movement against artificial mannerism in Italian painting. In the early 1580s they opened a private teaching academy that soon became a center for progressive art. In their teaching they laid special emphasis on drawing from life, and clear draughtsmanship became a quality particularly associated with their school. Possibly as a result of his study with Agostino Carracci, Franco published a collection of his own “facsimile font” figure studies in 1596, in which one or two human figures are positioned to form each of the letters of the alphabet. In 1595 he took over his father’s workshop and eventually became a well-known publisher. Although he was not documented as belonging to the booksellers’ or printers’ guilds, he is recorded in 1606 and again in 1619 as belonging to the painters’ guild. Franco’s determination to be recognized as an artist is reflected in his will, in which he refers to himself as a “designer.” Apart from his numerous works as an engraver and woodcutter, Franco also proved to be a pleasing portraitist, as seen in his illustrations for Le Risposte of Tiberio [?] Deciano (1579) and for Il Ballarino of Fabritio Caroso da Sermoneta (1581), the latter of which contains 23 different views of a variety of dances. The Habiti d’huomini is a potpourri of depictions of Venetian costumes, processions, and celebrations. Citizens are seen watching regattas, fighting on bridges, conversing in the Piazza San Marco and on the Rialto Bridge, and marching in ceremonial procession into the Doge’s Palace with flags flying and horns and flutes playing. Even the ubiquitous laundry is seen hanging on the line in the background. Men with rifles hunt ducks in the lagoon. The Doge’s mighty Bucintoro warship returns from battle, escorted by gondolas and saluted by cannon explosions. Carnival, of course, has a page of its own, which depicts citizens in masks, some of whom seem to be making best use of the cover of darkness to contact a prospective lover. The appropriately dressed widow is pictured heavily veiled, and a married gentlewoman has two outfits from which to choose, one for inside the house, another for outside. The men are almost as ornately dressed as the women. The Doge, in his palace wearing fine brocade and a crown, moves his hand in a sort of blessing, as – through a window behind him – life in the Piazza San Marco goes on. Michael Wentworth, former Susan Morse Hilles Curator of Paintings and Sculpture at the Boston Athenæum, died in September 2002 after a summer of reinstalling the art collections in 10 ½ Beacon Street following the Library’s three-year renovation. He was an inveterate Italophile and opera lover, and the acquisition of this book of Venetian dress and celebrations seemed especially appropriate to add to the collections in his honor. Ann Wadsworth from, Stanley Ellis Cushing and David B. Dearinger, eds., Acquired Tastes: 200 Years of Collecting for the Boston Athenæum (2006): 84-85. Copyright © The Boston Athenæum. The title continues: con la processione della ser[inissi]ma Signoria et altri particolari cioètrionfi feste et cerimonie publiche della nobilissima città di Venetia. Allgemeines Künstler-Lexicon (Munich: K.G. Saur, 2004), 43: 485. My thanks to Margarete Krengel for help with German translations.